If I made a list of the core best practices that have emerged on the web standards front, almost everyone reading this article would understand not only the practices themselves, but also the benefits that have caused these practices to emerge. Separate presentation from the (X)HTML document using CSS. Seriously, we know by now how structure gives us something to hang our proverbial hats on. And that semantics help make our content more meaningful and therefore more useful and reusable. And yes, we’re all-too-well-aware that CSS helps us keep our (X)HTML documents cleaner, smaller, more streamlined, more manageable and of course, more easily styled. While interest in web accessibility has increased over the past several years, another, quieter interest area has been just as important to making sites available to more people. Internationalization is a word most of us have heard, but that few understand. Internationalization, which is often written shorthand as i18n (first letter, 18 letters, last letter), refers to the practice of designing and developing a product, application, or document in a way that makes it easily localized for target audiences that vary in culture, region, or language. provides the technology relating to local, regional, linguistic or culturally-related concerns. In simple terms, i18n means understanding that the thing you’re designing and developing will be used by audiences around the globe. This is one reason internationalization is sometimes referred to as globalization. In order to understand internationalization more completely, it’s essential to understand the concept of localization (or l10n). Internationalization refers to the overarching ideology and mother-lode of technical features that enable us to make sites ready for a wide variety of audiences. Localization, on the other hand, is the actual adaptation of those sites to meet the language, cultural, and other requirements of a specific target market. sensitivity to cultural perceptions of language, iconography, and imagery. While internationalization gives us the technology and tools to target a given audience, it’s the act of localization that makes the site accessible to that audience. This is the tricky part, because while some aspects of localization—such as producing a site in languages other than English—involve an understanding of proper markup, the real challenge of localization is understanding the cultural needs of the audience you’re attempting to reach. Here in Tucson, Arizona, there are a large number of Mexican-Americans. This community is unique in its language, cultural references, and values as expressed in art, music, religion, and ritual. Subgroups within the main demographic reflect even more specific and complex influences based on the economic status, education, and access to resources of the individuals that make up these subgroups. Imagine that I’m working for a community outreach program that works with a specific group within this demographic to provide educational opportunities, language programs, and community resources. The world of this demographic is very different than my own—despite our proximity geographically. There are concerns of language—and I don’t mean just translating copy into Spanish! It will be critical that I use the regionalisms, terms, and cultural references specific to the Tucson area, which are going to be different than those of other U.S. cities close to the Mexican border, such as El Paso, which has its own regional and economic influences. Unless I have significant exposure to the unique aspects of Mexican-American life in Tucson, I most certainly need member representatives from that demographic to help me better understand the sociological significance of the imagery, colors, and other non-technical aspects of the outreach program’s website. Now that the meaning of internationalization and localization is more clear, we can begin to understand the relationship between internationalization and localization and the concepts we already use as standards-aware designers. When I write of a document’s structure, I’m referring to the building blocks that make up an (X)HTML document. Examples would include a DOCTYPE declaration, root element html, head, title and body elements along with any elements that are there for the structural integrity of the document. Note that this is distinctly different than semantics, which I’ll get to in the next section. The French word for <em>cat</em> is <dfn lang="fr">chat</dfn>. Other issues, such as bidirectional markup for documents with multiple languages and written in multiple directions (such as a document in English and Hebrew) also fall into this category. A lot of discussion has taken place over the last two years or so about semantics in web markup. There’s also been a lot of confusion over terminology. You’ll hear people say “structural markup” when they mean “semantic markup” and the like. To clarify, when I write of semantics, I’m describing the meaning of something. A semantic element is an element that best describes the meaning of the content it’s being used to mark, rather than describing the way that content should be presented. In the late 90s, debates about whether em and strong elements being better to use than i and b became a tired constant. At the time, we didn’t use the word “semantic” to clarify the discussion, but now we do, and it’s a lot clearer to us that “emphasize” refers to meaning, whereas “italicize” is presentational. Two ways of emphasizing the same line of text. Semantic naming for class and id values is also important. Choosing names based on function rather than the presentation is, as always, a good practice. In this case, the reason is that a function is far less likely to change during localization than is presentation, which is very likely to change. It’s back to the old “separate presentation from the document” concept with this one. If you want to create an internationalized and localized site that addresses a number of target audiences, you may have multiple presentation needs. Such needs would include fonts, line-height, emphasis styles, line-wrapping styles, and so on. This is particularly true for languages with accents or non-Latin writing systems. The next three screen shots display the same document styled in three different ways for three different audiences. You’ll notice differences in color, text location, and even text direction. Example with both English-language text and Chinese-language text visually emphasized. Example with English-language text visually foregrounded. Example with Chinese-language text visually emphasized and English-language text given secondary emphasis. While many people around the world work with aspects of i18n and l10n daily, most folks working in web design and development do not. I’m of the firm belief this is about to change dramatically in the next few years, as countries around the world begin to see the web as a clean, affordable, and advantageous technology that can be used to further international efforts. the technical and social issues within the internationalization realm. 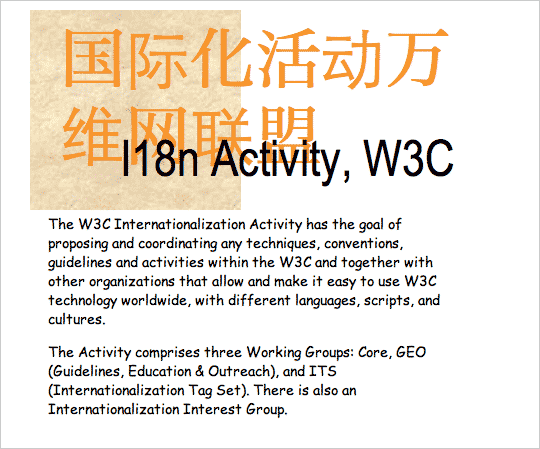 Check out the excellent resources at the W3C i18n web site, join the W3C i18n Interest Group mailing list, and try out The Web Standards Project. A very special thanks to Richard Ishida, Internationalization Lead, W3C, for his assistance and support. Also, you really only want to use and to promote UTF-8, in my humble opinion. Apart from those nitpicks, nice article! I’m creating a site that presents English, Hebrew and Arabic on the same page and I’m having real difficulty creating a page that has cross-browser compatibility AND validates. Can anyone recommend a good online resource? Although actually we could use more documentation about that. If we aren’t supposed to use anything like class=”red” or =”left”, preferring class=”sidebar”, in some other language it isn’t gonna be called a “sidebar.”? I agree with Joe that “in some other language it isn’t gonna be called a ‘sidebar'”. True, of course, but don’t we have the same problem with “class”, “id”, not to mention ““, ““, or “document.getElementsByTagName” for that matter? Maybe an interim solution is to adopt some kind of “standardized” tags (see for instance “What’s in a Name” at Malarkey http://www.stuffandnonsense.co.uk/archives/whats_in_a_name.html). Designers may not be using id and div names in their own language, but at least there might be some agreement as to what they are. If it is presenting three languages in abundance then usually UTF-8 will cover quite a lot of evils. However, it will also depend upon the fonts installed on the user computer as to how they display and text direction, i.e. Bidirectional text. Furthermore you’d have to consider both the CSS and the x(ht)ml ‘_lang_’ attributes. Re Robert S. “More on MULTI-Language support”; Using UTF-8 as mentioned by Robert W., Arabic, Farsi and Hebrew(not sure) are written right to left. If you are using combination of them in a page dir=”rtl” -direction Right To Left- can be helpful. I have used it for English/Farsi in rokni.net. Molly, Thanks for bringing to light a subject that really needs to be focused on more by web developers. Over the last year, I have been developing multi-lingual websites (http://www.engvocab.com – for example), and in the process learning a lot more about what is needed in these cases. It’s amazing how easy it could be to simple underestimate the amount of thought that needs to go into developing truly multi-lingual, multi-cultural websites. 1. Character encoding. UTF-8 is the safest bet – but support for it in some editors can be off. TopStyle doesn’t support it. 2. Language declaration. lang=”en” xml:lang=”en” for example. I think a bit more information on this may be needed. These are the ISO 639-1 codes. I believe that ISO 639-2 offers three letter alternatives also. As well as specifying languages, the standards stipulate that you can also specify varieties, ‘fr-ca’ for example; Canadian French. 3. the Semantic Implications. I learnt quite early on that Japanese has no Bold and Italics for example. The idea of emphasising words with a background colour is a good one, but has that been confirmed by a Japanese person to be an accepted method? 4. LTR (Left to Right) and RTL (Right to Left) Text Direction. This is something that seems a little vague still to me. More attention needs to be brought to this, and the best way of implementing it. You can specify text-direction in CSS, but this seems like a bad idea, since it is not a presentational aspect of web development. It is in-fact very Semantic. So a block of text in a RTL language should be specified as dir=”RTL”. All the best Molly. Thanks for bringing this out. Hope to hear more about it on ALA! Sorry, for the double post. I just found this good page on Joe Clarkes site regarding codes. un grand merci for your continuous efforts in spreading the good word (OT: and for trying to make I.E. less of a wreck, an important task since most IT managers lack the spine to try anything else). uh, guess what… The version Textile used in your commenting system does _not_ allow us to use the ‘lang’ attribute: %[fr]Quel dommage,% after such a nice article dealing with localization! _localization is not translation_. The article suggests to use semantics-driven names and elements, _not_ language-independant names (is there such a thing?). Clearly it does not matter what language you pick for your names. Just pick a language that you and your coworkers are familiar with — or have to work with. If you pick english, ‘sidebar’ is a perfectly good name as long as it is used in the meaning of its “Webster definition”:http://www.webster.com/cgi-bin/dictionary?va=sidebar (hint: it is not “a bar on the side”). Regardless of which human language is displayed within your sidebar, regardless of its location (top, side, bottom…), regardless of its appearance, it is still a sidebar. When, in 6 months from now, after two site redesigns, you come back to your code and find this class named ‘sidebar’, you will know right away what it is about. The only true method for writing international markup would be to define it in a database using XML. Why? Because it would allow each country to write the elements in their own language. Eg: yes for English, oui for French. This would then be converted to HTML, which of course is in American-English. Though I’m not sure if XML allows for kanji to be used in tags! For those looking for help developing content in right-to-left scripts, the following may help: Creating (X)HTML Pages in Arabic & Hebrew. Wrt language codes, note that RFC 3066 used to tell you how to create values for xml:lang and lang attributes. There is now a successor – it is approved by the IETF, but we are still awaiting an RFC number. The new IANA registry of codes is already available. 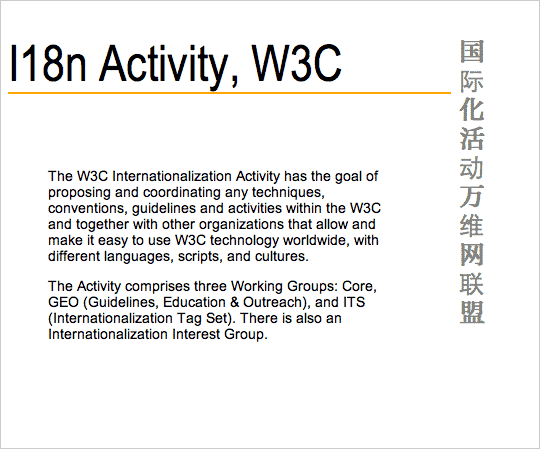 See a recent article by co-author Addison Phillips on the W3C i18n site, Understanding the New Language Tags. Well done Molly. Internationalisation is often a very tricky field and one which I suspect the vast majority of designers/developers are not used to dealing with even though any site on the web is available to all. I imagine that if html was invented by a Frenchman (for example) and all tags were in French then we would all have a very different perspective on building sites and be much more aware of language choices. bq. The only true method for writing international markup would be to define it in a database using XML. Why? Because it would allow each country to write the elements in their own language. Eg: yes for English, oui for French. This would then be converted to HTML, which of course is in American-English. Though I’m not sure if XML allows for kanji to be used in tags! I though Internationalization applied to the content of the page – not the markup?